My hat's off to you, Vladidmir, this new version (.96.2) is just simply the most amazing an visually stunning one yet! Huge improvements over an already staggering experience. What's more, I haven't had a single crash on it so far! Having installed, and run it a few hours at home, and now been playing around with it a bit at work. My suggestion is, it would be extremely cool if you could implement DoF. In this way it would all be fixed, free for the user to mess with. It could work like a plugin that could be disable/enabled. that they wouldn't be affected by small focus adjustments. But if you're taking a photo of another celestial object, from a grounds perspective on a planet, or with a lot of zoom, close to said planet, and with it still visible in the field - there would be some blurring. My hat's off to you, Vladidmir, this new version (.96.2) is just simply the most amazing an visually stunning one yet! Huge improvements over an already staggering experience. Can you show a example? May be you mix up DoF with diffraction limit or aberrations, that limits the sharpness of real photos? I think that DoF wouldn't be all that necessary in SpaceEngine. 99% of the time, you're looking at objects that are all very far away, and the only way that you could achieve a small enough DoF to produce a noticeable effect is if you used an absurdly long focal length. From a realism standpoint this would make no sense. I can see scenarios in which it might be both cool and realistic, but not many. If this were added to the engine, it should be added at a much later time. There are many much more important features than are still missing that would add eyecandy and realism even more so that DoF (3D clouds and night-maps top my list). But it would still be interesting to talk about how DoF might be implemented. Can you show a example? I've taken some shots and edited them with photoshop to illustrate what I mean. 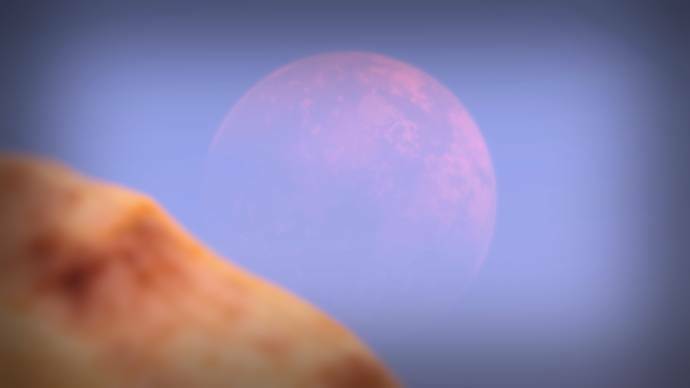 This one simulates again long focal length, with a peak in the foreground, obscuring the planet in the horizon. I think that DoF wouldn't be all that necessary in SpaceEngine. 99% of the time, you're looking at objects that are all very far away, and the only way that you could achieve a small enough DoF to produce a noticeable effect is if you used an absurdly long focal length. Hardts, I do like the effect produced in the second picture, it shows fair realism. But the first picture is rather comical in my opinion, it makes kilometers of landscape look like a 50 cm tabletop model. This is exactly my objection to DoF in SpaceEngine. 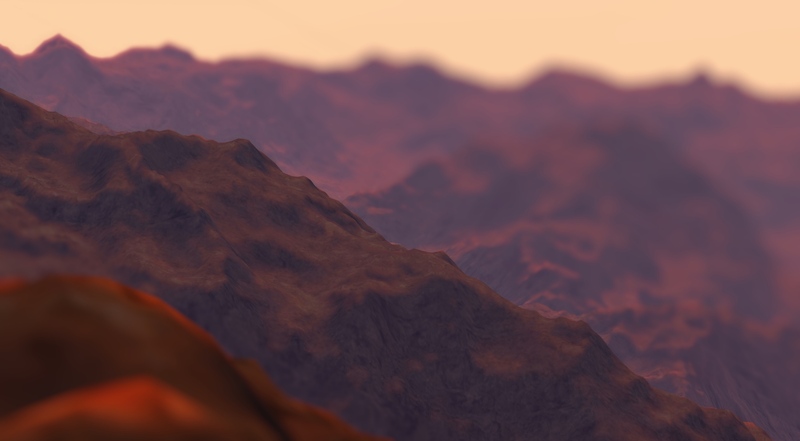 To show DoF effects in most scenes in SpaceEngine would require focal lengths than no realistic optics could produce, and would really distort the sense of scale. When focused at infinity, anything more than a few hundred meters away should not be affected by DoF effects. I don't mean to sound harsh, I know I can come across that way. I just don't see this as something that can practically be included in SpaceEngine anytime soon. Basically useless until some sort of walking astronaut mode is included. Yes. Until SE gets down to human scales, DoF effects would not be very useful. I agree with Hardts, DoF at such scales reminds me of a video taken on cameras with a large focal distance: combined with timelapse it makes buildings, cars, humans, waves on the sea looks like toys. (I can't remember the youtube link). The same reason why I don't like the idea of 3D in SpaceEnigne. The second screenshot looks like you're eating a piece of pizza. Also, DoF might come it useful if you added props on land (rocks/trees) or if you wanted an arty looking screenshot of a spacecraft. Anyways, since I'm finding it difficult to select out nearby stars (within 100 or even 50 parsecs, even with the procedural stars on) while among the catalog stars because the brighter objects (mostly giants, but supergiants and sometimes subgiants contribute to the issue) tend to grab the selector instead of nearby objects. What I thought of when I read Depth of Field was that it would limit how far away (or how close) an object needs to be to be visually shown. That would be nice but even done on the GPU it takes massive computation, it would bring most peoples systems to their knees. Actually most video games use DoF with nearly no impact. 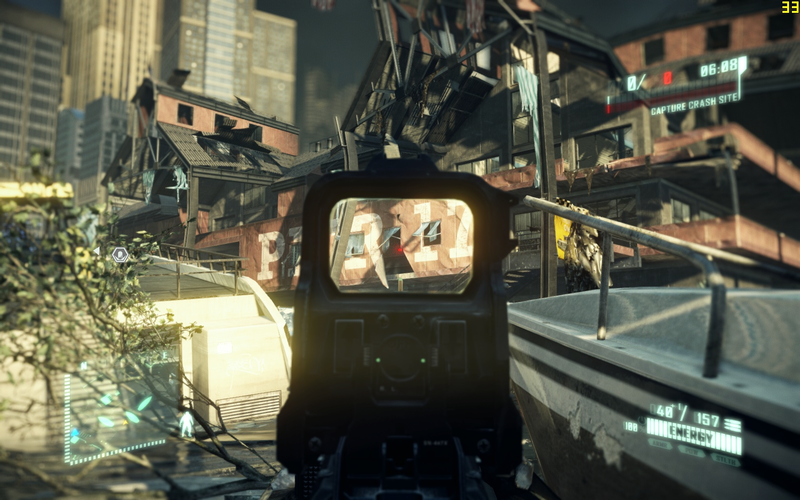 And some games use Bokeh DoF which looks very very nice, with a bit more impact but still acceptable. So it is impossible to implement DoF on big scales, only on the planetary scale. This is what I was thinking, but it would be good on artistic shots. Right now, SE doesn't have enough detail to warrant DoF. But in the future, maybe when there are cities and rocks and trees and other detail objects, DoF might come in handy to add the extra artistic shots when you do close ups.